I'm lucky that for the most part I have quite good skin, the only thing that really annoys me is the dark circles under my eyes. I always end up layering concealers to try to hide the purple colour and yet they are never completely covered. 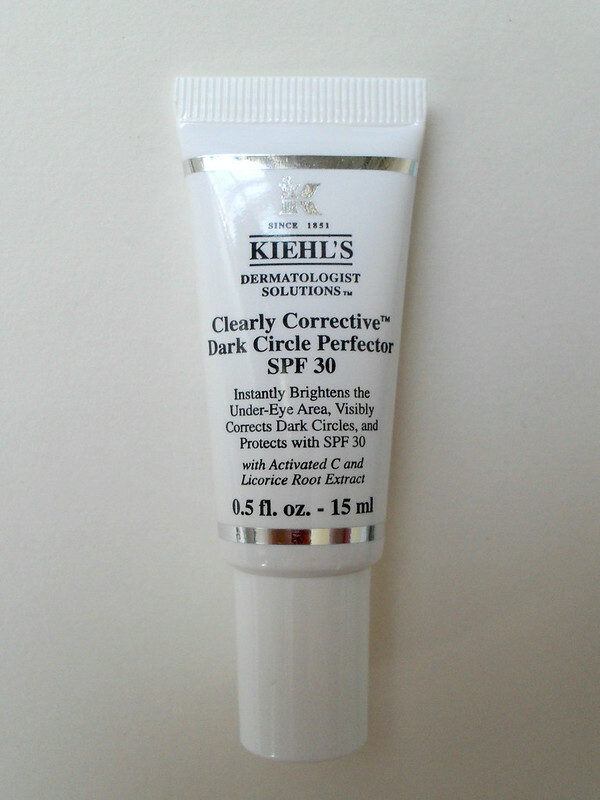 I started using the Kiehl's Clearly Corrective Dark Circle Perfector a couple of months ago and I have since had a noticeable reduction in the darkness under my eyes. I had been using the product, not really thinking much about it until a couple of weeks ago when one of my concealers ran out and I didn't want to go rooting for another one so I just used one under my eyes for the first time in a long time. 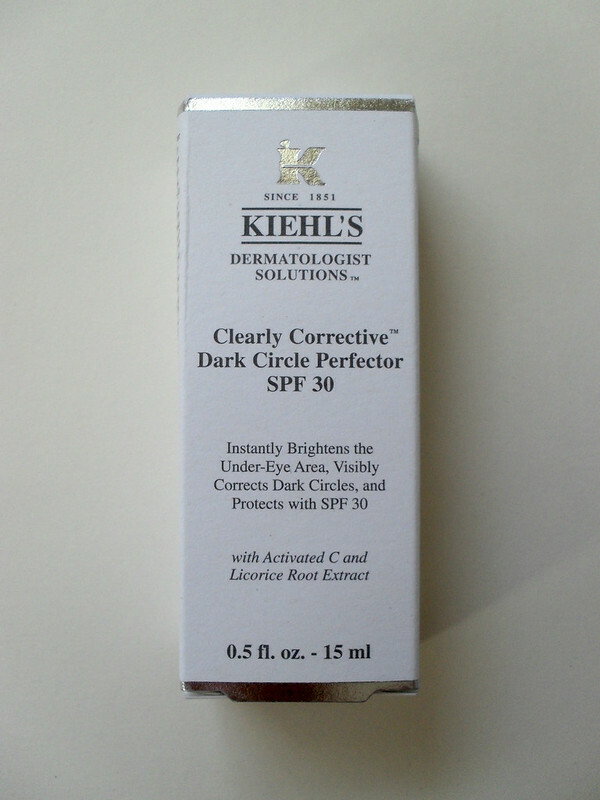 I was surprised that I didn't actually feel that I needed any more coverage and that's when I realised it was this little gem from Kiehls's at work. 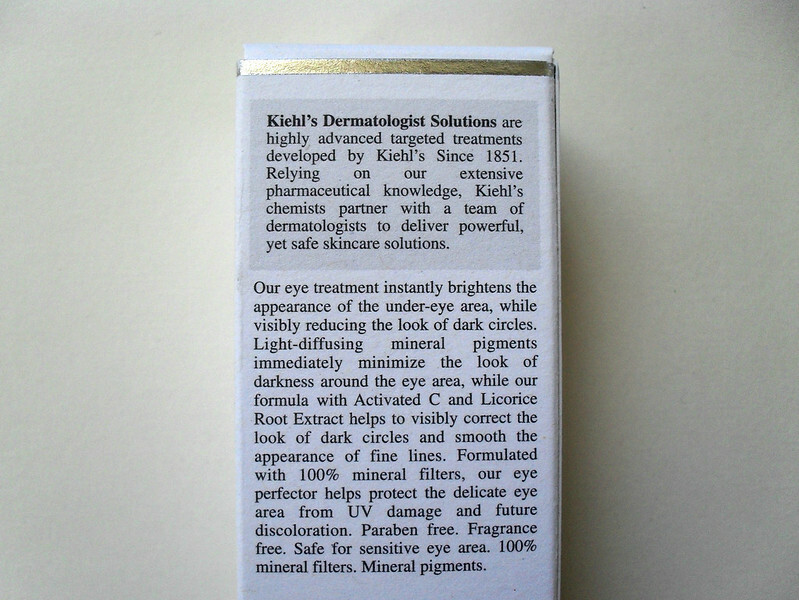 Kiehl's chemists research showed that under eye discolouration can be increased with skin aging as it gets thinner and blood pools under the surface of the skin, poor circulation and UV damage can add to the problem which is why they created a product to address all of these issues at once. This is not a concealer, it is a tinted eye treatment that contains light diffusing mineral pigments to give an instant brightening effect. I took a before and after comparison photo which you can see below to show you what it does when you first apply it. You can use it over your usual eye cream as it has a very light texture. It gives a sheer coverage that aids with concealing but I definitely need a concealer on top of it. I like that it offers both immediate and long term benefits for the skin under my eyes. It contains Licorice Root Extract and Activated C, a Vitamin C derived ingredient used to correct discolouration and also clarify and smooth the skin tone and texture. It also contains SPF 30 and titanium dioxide, a mineral UV filter to protect the delicate eye area from premature skin aging caused by the sun. It also contains caffeine to reduce puffiness so you are really getting all round care for the eye area. I have really been enjoying using this product, not only could I see an immediate effect, but after a couple of months of use I am amazed at the long term effects and I'm so happy to have finally found a product that actually works at addressing the causes of my under eye darkness instead of just masking them. It comes in a handy small tube, perfect for travelling with or keeping in your handbag. It doesn't come cheap at €34, however I've been using it for about 2 months and there is still so much left in the tube so I really think the price tag is worth it. I'll be going straight out to buy it again when I run out. What's your biggest skin concern? Do you use an eye cream? Definitely has made a difference, think I need to check this one out Em! I need this is my life. 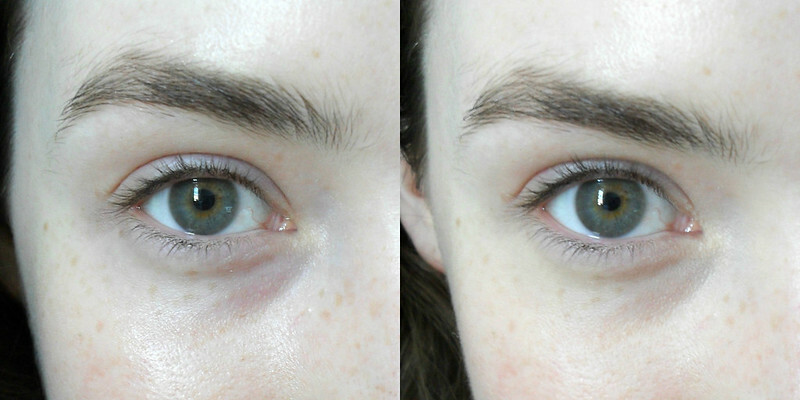 I'm the poster child for dark circles and this looks like it really makes a difference. I will fo'sho be picking this up. Thanks for the recommendation. Thanks Emma ! I so badly needed this post. I have tried couple of products but not too happy with them. Hope this cream will not disappoint me. Explore http://beautynskincare.com/anti-aging/ for more.